Micro enterprises earning less than P250,000 annually will no longer be required to pay percentage taxes thanks to the amendment pushed by Sen. Bam Aquino on the proposed tax reform program. During the period of amendments on the Tax Reform Acceleration and Inclusion Act (TRAIN), Sen. Bam pushed for an amendment that exempts micro enterprises earning below P250,000 from paying percentage tax, on top of their income tax exemption. “Exempted na sa percentage tax ang mga fishball vendors, sari-sari store owners, pati ang mga magsasaka at mangingisda na kumikita ng 250,000 pesos or less sa isang taon,” said Sen. Bam Aquino, a former social entrepreneur and principal sponsor of the Go Negosyo Act. “We moved for this amendment because we have received many reports that some micro businesses are being required to pay the 3% percentage tax,” Sen. Bam added. Sen. Bam said the amendment will ensure a tax-free status for our micro entrepreneurs and free them from harassment by tax agents, at no additional cost to the government. The senator also proposed to simplify bookkeeping records and requirements for micro businesses. Sen. Bam is thankful to Sen. Sonny Angara, chairman of the Committee on Ways and Means, for accepting both these amendments in support of the micro enterprise sector. “Protektahan natin ang kita ng mga maliliit na negosyo at kabuhayan ng maraming pamilyang Pilipino,” said Sen. Bam, adding that this will help one million Filipinos or more. The Senate will continue to deliberate on the amendments to the TRAIN on Monday. “We will ensure that this amendment will make it to the end,” said Sen. Bam. 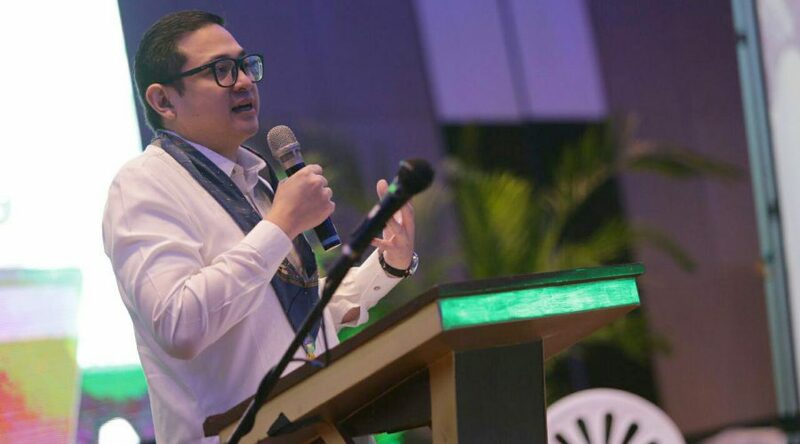 Senator Bam Aquino urged rural banks to expand their services to more small businesses, saying many local entrepreneurs still need access to reasonable loan packages that can help them grow their business. Sen. Bam issued this plea during his speech at 60th Charter Symposium of the Rural Bankers Association of the Philippines (RBAP) recently. “Nagpapasalamat ako sa RBAP sa inyong pagsisikap na maabot ang ating mga kababayang nangangailangan ng serbisyong pinansiyal. Marami pa po ang nangangailangan ng ating tulong,” said Sen. Bam. During his time as a social entrepreneur, Sen. Bam learned that lack of financing poses a big challenge for micro, small and medium enterprises as it hampers their development. “So when I became a senator, we focused on policies that can help support our MSMEs in the Philippines,” Sen. Bam pointed out. One of them is finding ways to link MSMEs to financial institutions, including rural banks, to help their search for fresh capital to start or expand their businesses. In his four years as senator, Sen. Bam worked for the passage of Republic Act 10644 or the Go Negosyo Act, the first of his 19 laws as legislator. The law mandates the establishment of Negosyo Centers in every town, city, municipality, and province of the country to serve as support hubs for entrepreneurs. As of now, there are over 600 Negosyo Centers across the country that link MSMEs to suppliers and markets, providing training and support and connect them to sources of capital and financing. As its principal sponsor and co-author, Sen. Bam also pushed for the enactment of Republic Act 10679 or the Youth Entrepreneurship Act , which mandates the inclusion of financial literacy and entrepreneurial training will be included in basic education. “This will help groom young Filipinos to be responsible with their money and savings,” said Sen. Bam. Sen. Bam also passed other laws in support of MSMEs, such as the Philippine Competition Act, Foreign Ships Co-Loading, Microfinance NGOs Act and the Credit Surety Fund Cooperative Act. In the 17th Congress, Sen. Bam has filed the Philippine Islamic Financing Act, National Payment Systems Act and the Secured Transactions Act, measures that will help enhance the credit-worthiness and bankability of Filipinos, particularly small business owners. Sen. Bam Aquino recently sponsored three measures that aim to support Filipino scientists, engineers and innovative start-ups, believing that technology and innovative initiatives can help solve problems besetting the country. Recently, Sen. Bam sponsored Senate Bill No. 1532 or the Innovative Startup Act where he urged colleagues to pass the measure that provides different forms of assistance to over 200,000 innovative start-up businesses, giving them better chance of succeeding. If passed into law, it will provide support innovative startups through financial subsidies like tax breaks and grants and other forms of assistance such as ease of red tape in business registration. It will also give technical assistance and training programs, free use of equipment, facilities and support for patenting or licensing of their product through the Intellectual Property Office of thePhilippines, according to Sen. Bam, chairman of the Committee on Science and Technology. He also delivered his sponsorship speech for Senate Bill No. 1533 or the Balik Scientist Act and Senate Bill No. 1534 or the Magna Carta for Scientists. The two measures aim to promote the welfare of Filipino scientists, engineers and researchers. “The challenge for us today is to ramp up support for Filipino scientists, engineers and researchers, and to harness their talents, not just to boost industries and business, but to build a better Philippines for all,” said Sen. Bam. Currently, the Philippines has 189 scientists per million, far from the ideal target of 380 per million. “Our country still lacks 19, 000 scientists to meet the bare minimum that is essential and acceptable in the development of any country,” said Sen. Bam. Senate Bill No. 1533 aims to encourage scientists, engineers and innovators working in different parts of the world to return and help solve the country’s problems through financial incentives. “Pahalagahan po natin ang agham at teknolohiya, ang mga siyentipiko, mga inhinyero at mga researcher upang tuluyang umasenso ang Pilipinas,” said Sen. Bam. Sen. Bam Aquino urged unemployed Filipinos to visit the closest Negosyo Center so they can get help in starting a business. “Habang wala kayong nahahanap na trabaho, bakit di muna subukang magnegosyo. Hindi dapat matakot dahil naririyan ang mahigit 500 Negosyo Centers sa iba’t ibang bahagi ng bansa para kayo’y tulungan,” said Sen. Bam. According to Sen. Bam, the Negosyo Centers have served around 800,000 Filipinos, from retired overseas Filipino workers (OFWS) to plain housewives, giving them the means to supplement their household income through business. “Sa ngayon, marami nang mga Pilipino ang kumikita sa simpleng negosyo dahil sa tulong ng Negosyo Center,” said Sen. Bam, who has met with some of these successful entrepreneurs during his Negosyo Center visits. Sen. Bam was the principal author and sponsor of the Republic Act No. 10644 or the Go Negosyo Act during his term as chairman of the Committee on Trade, Commerce and Entrepreneurship. It was the first of 17 laws passed by Sen. Bam in the 16th Congress. A legislator called on the Department of Education (DepEd) to implement the law encouraging students and graduates to venture into business. “Nananawagan tayo sa Department of Education na ilabas na ang Implementing Rules and Regulations para sa Youth Entrepreneurship Act upang mapakinabangan na ng ating mga kabataan,” said Sen. Bam Aquino. 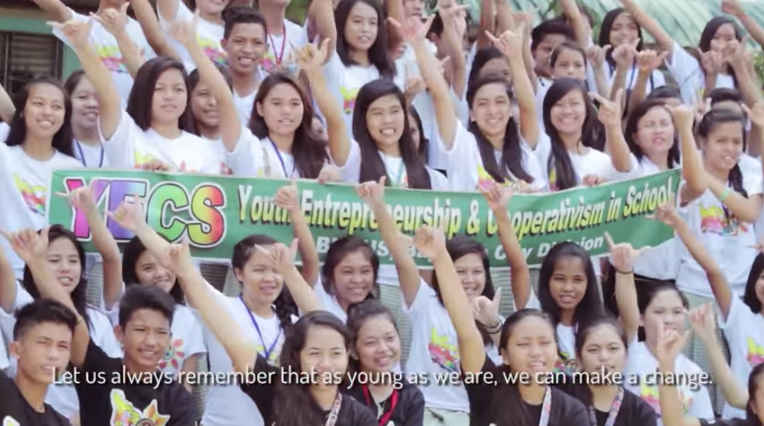 The Youth Entrepreneurship Act or Republic Act No. 10679 was passed August 2015 but no IRR has been released. The law mandates that the IRR be promulgated within one hundred twenty (120) days from its effectivity. The law encourages young would-be entrepreneurs to establish their own business by providing them access to capital and other support. It also creates financial literacy modules in all levels of Philippine education, to inculcate a culture of enterprise development among the Filipino youth. “Gusto nating makakita ng trabaho ang ating mga graduates ngunit mayroon din silang opsiyon na pumasok at magtagumpay sa pagnenegosyo. Matutulungan sana ang ating kabataang magtagumpay sa negosyo kung ma-implement ng maayos ang iilang mga batas na ating isinulong noong 16th Congress,” said Sen. Bam. Sen. Bam was the author and principal sponsor of the Go Negosyo Act (Republic Act 10667), his first law in the 16th Congress, and the co-author and principal sponsor of the Youth Entrepreneurship Act. The senator pursued the passage of these two laws during his time as chairman of the Senate Committee on Trade, Commerce and Entrepreneurship in the 16th Congress to cater to the needs of micro, small and medium enterprises (MSMEs). “These two laws provide MSMEs a conducive environment they need to succeed. At the same time, they also help provide fresh jobs and other livelihood opportunities for their fellow Filipinos,” stressed Sen. Bam, adding that MSMEs account for 66 percent of jobs in the country. At present, Sen. Bam said 470 Negosyo Centers are already up and running in different parts of the country, catering to the needs of MSMEs. In the 17th Congress, Sen. Bam filed Senate Bill No. 169 or Small Business Tax Reform Act, which provides small businesses with lower income tax rate, VAT exemption and other privileges. Sen. Bam has also submitted Senate Bill No. 175 or the Innovative Startup Act seeking to ease restrictions and provide incentives for startups in the Philippines. While it aggressively pursues abusive loan sharks, the government must also strengthen the country’s microfinance institutions (MFI) to help address the financing needs of the poor, according to Sen. Bam Aquino. “As author of the Microfinance NGOs Act, we are supportive of eradicating 5-6 in the Philippines,” said Sen. Bam, referring to Republic Act 10693, which he pushed as co-author and principal sponsor during his term as chairman of Committee on Trade, Commerce and Entrepreneurship in the 16th Congress. The senator pointed out there are better alternatives to 5-6, like MFIs NGOs that provide alternative low-interest, no-collateral financing to the poor and would-be entrepreneurs who need loan to start their own business. “There are better alternatives to 5-6, whether these are government programs, or led by the private sector. Mas magandang masuportahan ang mga grupo at programang ito na regulated ng goberyno na makapagbibigay rin ng pautang na hindi kasintaas ng mga 5-6 ang interes,” he added. Sen. Bam called on the BIR to finalize tax regulation for MFI-NGOs for the law to be fully implemented and fulfill its mandate to give the poor low-interest financing. Microfinance NGOs provide Filipinos access to low-interest, no collateral loans to pay for housing, medical, and educational needs as well as loans for small businesses. Republic Act 10693 gives incentives to microfinance NGOs to continue helping Filipinos overcome poverty not just through financing but also through financial literacy, livelihood, and entrepreneurship training. The law also provides microfinance NGOs needed support and incentives that includes access to government programs and projects, technical assistance and exemption from taxes. “MFI NGOs aid our poor countrymen in times of inflation and price increases. They also provide financing and training for livelihood and small businesses so families can overcome poverty,” he said. At the same time, Sen. Bam called on concerned government agencies to expedite the release of the implementing rules and regulations for Republic Act 10744 or the Credit Surety Fund Act. Aquino, author and sponsor of the measure’s Senate version, said it will institutionalize the CSF program of the Bangko Sentral ng Pilipinas (BSP), which addresses loan requirements ranging from P200,000 to P5 million. A senator wants to integrate programs on entrepreneurship for overseas Filipino workers (OFWs) to help them start their own business, making it unnecessary for them to leave their families to work abroad. “Mas maganda kung hindi lang tuwing Pasko o kada dalawang taon lang nabubuo ang pamilya ng OFWs. Mangyayari ito kung mayroon silang sapat na pagkakataon at kaalaman na makapagsimula ng negosyo,” said Sen. Bam Aquino. Sen. Bam has filed Senate Bill No. 648 or the Migrant Workers and Overseas Filipino Assistance Act to boost support for the OFW community and the families they leave back home. If passed into law, the measure integrates programs on livelihood, entrepreneurship, savings, investments and financial literacy to the existing efforts of embassies to equip OFWs with knowledge to start their own business. “Sa pamamagitan nito, magkakaroon sila ng sapat na kaalaman para magtayo ng sarili nilang negosyo upang hindi na sila mangamba sa kanilang pagbalik sa Pilipinas,” the senator stressed. In addition, Sen. Bam also encouraged families of OFWs to visit the nearest Negosyo Center to get a proper advice on what kind of business to establish while their loved ones are working abroad. “Mahalaga na pag-uwi ng ating mahal sa buhay sa Pilipinas, makikita nila ang bunga ng kanilang pinaghirapan,” said Sen. Bam. Aside from the livelihood aspect, Senate Bill No. 648 mandates the Public Attorney’s Office to establish a help desk in every international port of exit in the Philippines to offer legal service, assistance and advice to departing migrant workers. “It also sets effective and efficient information dissemination on labor, employment, and migration data through various mediums, including social media, to provide OFWs with credible formation” said Sen. Bam. Sen. Bam recognizes the immense contribution of OFWs to the Philippine economy, saying that from January to August 2015, their remittances reached $16.21 billion or P764 billion. Despite this, OFWs remain vulnerable to poor working conditions and abusive employers. In addition, their employment abroad is no guarantee of financial success. In a survey conducted by the Bangko Sentral ng Pilipinas (BSP) last September 2015, only 38.2 pecrcent of the 563 household‐respondents said that a portion of the money from OFWs are set aside for savings. “This is very alarming since many OFWs come home without a plan for retirement,” Sen. Bam said. 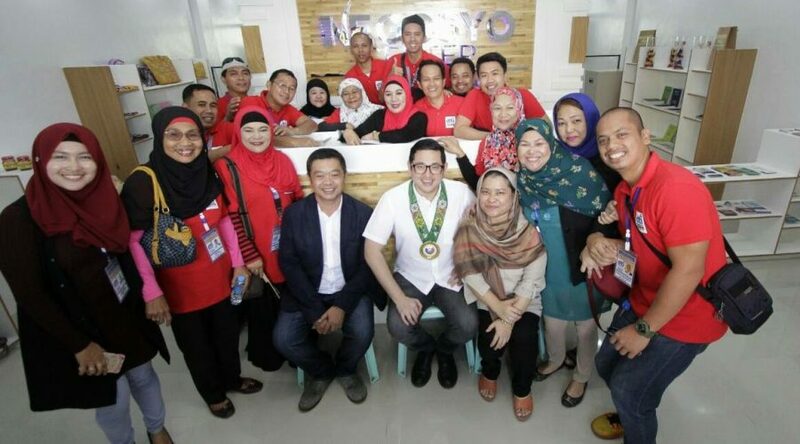 Senator Bam Aquino credited the success of Negosyo Centers to the continued cooperation between the legislative and executive branches of government as well as the private sector. “Maayos po iyong batas, nakapondo po ito. Ngayon po ipinasa na sa executive. In fairness to our DTI family, buong-buo ang kanilang pagtanggap sa Negosyo Center. They’ve made the Negosyo Center one of their priorities,” said Sen. Bam during the launching of the 400th Negosyo Center in Marikina City. Sen. Bam is the principal author and sponsor of the Republic Act No. 10644 or the Go Negosyo Act in the Senate. Through the Negosyo Center, Sen. Bam said the Department of Trade and Industry (DTI) now has a frontline service organization that will cater to the needs of micro, small and medium entrepreneurs. “May 400 na sentro na pong pupuntahan ang ating mga maliliit na negosyante para makahingi ng tulong, kahit saan pa sila bansa,” Sen. Bam pointed out. Sen. Bam also lauded the private sector and non-government organizations for its participation in the success of the Negosyo Centers. “In many areas, the Negosyo Center has become a focal point for support, even NGOs, microfinance groups, basta may kinalaman sa pagtulong sa maliliit na negosyante, ito na ang kanilang bahay,” the senator pointed out. The Negosyo Center will provide access to bigger markets and financing for businesses, training programs, and a simplified business registration process, thus helping ease of doing business and fast-track government processes in putting up a business. Sen. Bam continues to work closely with the DTI to ensure the effective implementation of the law. According to the DTI, the number of Negosyo Centers will increase to 420 by the end of 2016. Sen. Bam Aquino encouraged traders to visit a Negosyo Center first to get proper advice, guidance and training as they embark on a business venture this Christmas season. “Ngayong kapaskuhan, maraming magtatayo ng bazaar sa pamilihan at mall, kaya inaasahan natin na maraming negosyante ang sasali sa mga ito,” said Sen. Bam, principal author and sponsor of the Republic Act No. 10644 or the Go Negosyo Act in the Senate. “Sa lahat ng gustong sumabak sa negosyo, maaasahan niyo ang tulong at suporta ng mga Negosyo Center,” added Sen. Bam, chairman of the Committee on Trade, Commerce and Entrepreneurship in the 16th Congress. At present, over 300 Negosyo Centers are now established in different parts of the country to cater to the needs of micro, small and medium enterprises. The number is expected to rise before the year ends. The Negosyo Center will provide access to bigger markets and financing for businesses, training programs, and a simplified business registration process thus helping ease of doing business and fast-track government processes in putting up a business. Aside from the Go Negosyo Act, Sen. Bam has five other laws focused on the development of MSMEs in the country. These are the landmark Philippine Competition Act, Foreign Ships Co-Loading Act, Microfinance NGOs Act, Youth Entrepreneurship Act and Credit Surety Fund Cooperative Act. To know the Negosyo Center near you, visit https://www.bamaquino.com/gonegosyoact/negosyo-center-tracker/.